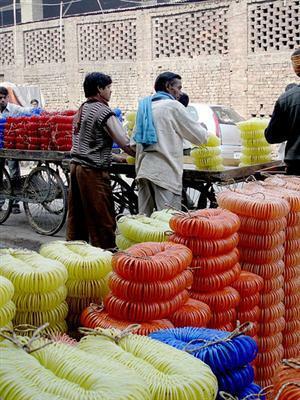 How Glass bangles are made at Firozabad? Glass bangles are liked and worn by many women all over India, particularly the married women, as Glass bangles are considered as the symbol of being a married women or as it is said Suhagan in the local language, Hindi. Firozabad has earned the name of Suhag Nagari that is the city for married women. 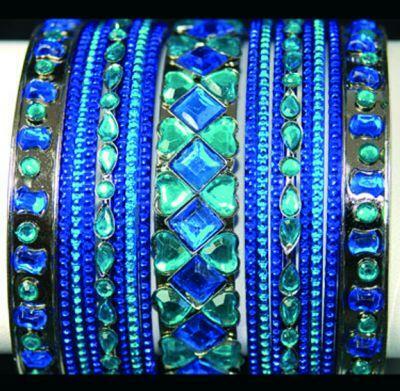 Glass bangles are the main symbol of the married women and means prosperity for the women who wear them. Now the industry is facing flak from the media because they use children for joining and designing bangles, who have to work under high temperatures , in dark rooms and in the crouched positions for long periods. They will be inhaling soot and dust from the dry glass mixture as well as the other chemicals used in the industry. The process is very long and intricate which involves extremely precise and detailed work. The raw glass used for the making of the Bangles is the same as the ones that are used for all the other products of the glass industry like Chandeliers etc. which are made in the factories. The molten glass is made to pass through the furnace pipes and the glass gets beaten into shape of equal dimensions without removing from the pipes. This molten glass is passed through automated rollers which stretches out like threads. The molten glass wraps itself on the rollers and a spring like glass is made which is then cut with the cutter used for cutting diamonds. After cutting the springs the open edges have be joined to form a bangle. This process takes place in a separate unit and the work is known as judai. You can see an air compressor which is connected toa chimney of Kerosene the bangles are joined. The next step is sadai where the jagged ends are smoothened and made to look like a ring. The glass is made to melt a little and by applying pressure on both ends the joint is straightened out. These are done by the women workers of the group. Even after this the bangle has to pass through 10 - 15 hands before the bangles are packed and sent to the shops. It is then decorated, using ornamental mirrors, glitter and many other varieties of embellishments. First it is the same process as for a Bangle but then, several bangles are melted together to make a thick bangle named Kada.The drawings are designed on the kada with a thin glass band. Not only designing, engravings are also done on the Kadas using rotating grinders. . The process changes a little more if multi colour kadas are made. Sometimes an hardener is mixed with resin in equal quantities to make a paste which is coated over the bangle and then the bangles are rolled over the Zari Powder. If a bangle is to be coloured white it is then sprayed by the air compressors.